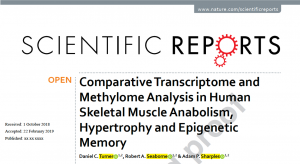 Comparative transcriptome and epigenome paper published in full! In this new @SciReports paper (PDF), we identify epigenetically altered pathways in muscle hypertrophy that include matrix/actin remodelling, mechanotransduction (e.g. FAK, PLD) & protein synthesis (e.g. GSK3B). Particularly excited about FILAMIN B linked with epigenetic muscle memory! Our latest Epigenetics paper has been posted as a Pre-Print!